The Newest Way to Build Your Franchise Sales. We’re skilled in developing strategically targeted plans and proven tactics to drive community engagement and sales at the individual franchise level. HubKonnect integrates and analyzes thousands of data points to identify unique sales-building opportunities for each location, making it easy and efficient to market and grow at the local level. HubKonnect provides a complete communications plan that recommends exact timing, communication channels, and implementation actions. We believe Local Store Marketing (LSM) is an essential sales driver for any franchise or company-owned location. We believe all franchisees should have the resources and expertise to create effective local marketing strategies. LSM builds a strong foundation to drive exponential sales within each unique trading area—maximizing the impact of national and market-wide marketing efforts. This strategy allows each individual location to thrive. The HubKonnect goal is simple: maximize customer connections, transactions, and sales. Co-founded by LSM expert Kathy Hartman and technology pioneer Michael Koch, HubKonnect brings years of local marketing wisdom and technological expertise to each individual location. Learn more about our leadership team here. 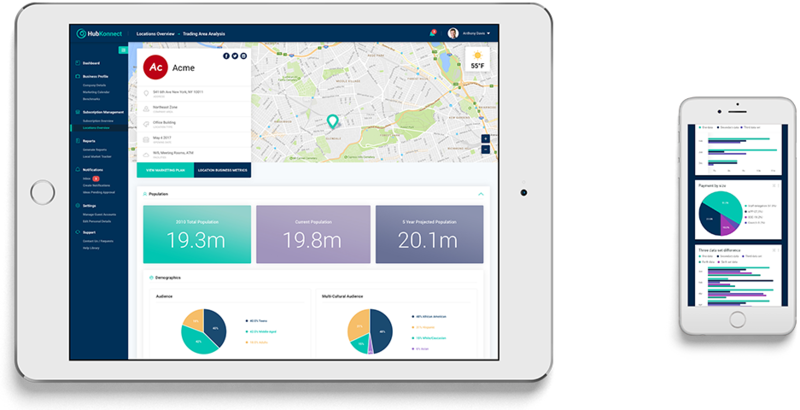 Our intelligent software factors up-to-date, local demographics, multi-cultural segments, traffic generators, competition, community events and much more, to create an in-depth trading area analysis for each individual location. Specify your location, your objectives and your time period. Then HubKonnect combines in-depth LSM knowledge with Artificial Intelligence, to analyze your trading area opportunities and generate a plan tailored to drive sales based on your specific opportunities. HubKonnect is continually adding new information to our database. Find the latest ideas, tactics, and best practices to meet your sales and business objectives. Instantly, generate customizable content, based off real-time, demographic data. Uphold brand standards and consistency and align with the appropriate creative for use in the execution of your plan. Receive an easy-to-execute communications plan and implementation checklist to get the message out to your local customer base. Anyone in your organization can ensure flawless, efficient execution. A custom dashboard provides visibility into LSM performance and ROI through POS integration and system generated data.